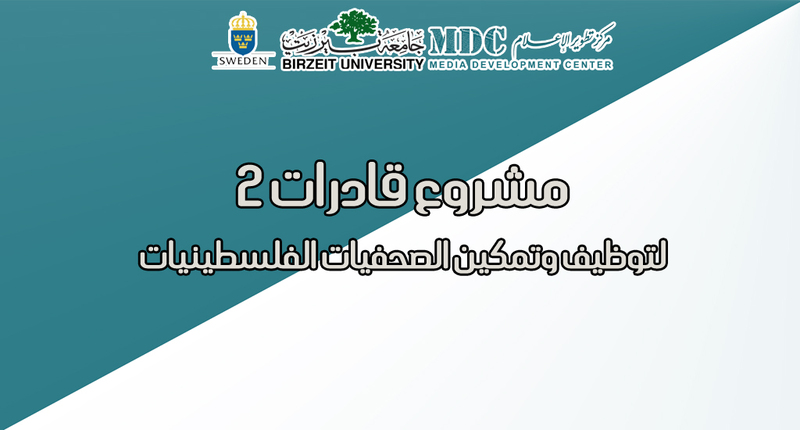 The Media Development Center at Birzeit University is running a second ‘Qadirat II’ (capable women) project to create job opportunities for unemployed female journalists and to bridge the gap between the lecture room and the editing room. Women are significant in number and performance in lecture rooms, but almost absent in media editorial and management positions. The most important mission of the MDC gender unit during the next stage is recruitment and empowerment. The project targets female journalists about to embark on their professional career and new media graduates, as well as female journalists who have 1-5 years of experience. Qadirat II seeks improved representation of women in the media on two levels: increasing the number of journalists working in the field, and encouraging future female journalists to become decision makers in the media institutions where they work. We believe that this will lead to improved media coverage of gender issues. We launch the second project with 40 young female journalists who will engage in a series of training courses to prepare them for the job market in the West Bank and the Gaza Strip. The project will finance their salaries for three months during on-the-job training at local and international media institutions. The project is funded by SIDA (the Swedish International Development Agency). Due to the intense competition in journalism, the project team will make every effort to attract female journalists with the highest potential. Professional competency, career prospects, and commitment to working in journalism are the three major criteria in the selection process. Competence: Based on academic certificates and relevant experience. Career prospects: Based on examples of published journalistic work. Commitment to work in journalism: Based on a professional plan drafted on one page and included in the application. MDC will ensure that different journalistic specialties are represented (press correspondence, editing, production, photography, and directing). Adhere to the existing official administrative and professional regulations in the media institution where you are assigned for on-the-job training. Participate in all the specialized training courses offered by MDC as part of the project. Commit to assigned readings and/or any professional development activities adopted by MDC and/or the hosting media institution to ensure maximum benefit from participation in the project. Compile a file of all the press materials published during your participation in the different project activities. Provide MDC with a professional resume at the end of the project to be posted on a dedicated electronic site to be launched after the project. Present a report about your participation in the project and commitment to participate in project evaluation activities. The selection process is entrusted to a panel of professional female journalists. Applications will be presented to the committee without the names. Selection will be based on an examination of the applications and acceptance of applicants with the highest score. The application may be completed online. For more information about the project, please contact MDC at 2982000 ext. 5258.